We often applaud the development and upliftment of Indian talent while analyzing the pros of the much-celebrated Indian Premier League. The IPL has not only added depth to the Indian national setup by bringing the best out to the forefront, but also helped the innovation side of the gentlemen's game. However, we tend to overlook the fact that it's not just the homegrown players who hone themselves in the premier T20 festival of India, but the foreigners as well. Over the years, many foreign players have used the IPL stage to stake claim for themselves in the international circuit as well. A few examples can be David Miller from KXIP and Chris Morris from the now-defunct Delhi Daredevils. But, arguably no other player can be a bigger testament to the above discussion than David Warner. The explosive left hander, often called the 'pocket rocket' of Australia, is perhaps one of the best batsmen going around at the moment across all three formats. He made his debut way back in 2009 for Delhi as a young, lion-hearted cricketer from New South Wales, who oozed potential and could become a T20 specialist. Fast forward to the present, and Warner is not just a T20 batsman. He is one among the miniscule group of players who are an established force across the formats. He is a leader - someone who's taken the aerial route, not with his bat all the time, but with his career. From the shortest format of the game, he has gone on to feature for Australia in ODIs and then Tests, which is a detour when compared with the resumes of other world-class cricketers. We haven't seen much of David Warner from last 11 months due to the infamous ball-tampering scandal in March last year - an incident that certainly enticed a large portion of the fraternity to turn its back on him, but most certainly, one can simply not keep away from Warner's infectious talent. On that note, let's revisit the top three knocks by David Warner in IPL history. 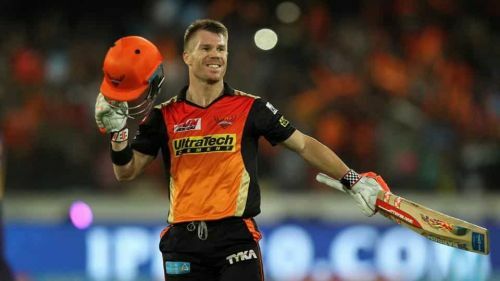 Warner led SRH to a masterclass in IPL 2016, finishing third in the table, and then going on to win three games on the bounce to lift the trophy. In the Qualifier 1, RCB had upstaged table-toppers Gujarat Lions to cement a berth in the final. SRH meanwhile, had progressed to the Qualifier 2 on the back of a victory against KKR. Gujarat struck a decent score of 162 in the first innings. It was always a tricky chase, but Warner ensured no nonsense from his team's side by taking the baton and firing SRH to the final. He scored a staggering 57.06% of his team's runs with an unbeaten 93 of 58. There was nothing missing from this innings. Warner bludgeoned the ball beautifully, kept the required rate in check despite having to witness the fall of wickets down the other end. Nobody except Warner managed to rise to the occasion, but the former Australian vice-captain took it upon himself to spearhead the side's chase. 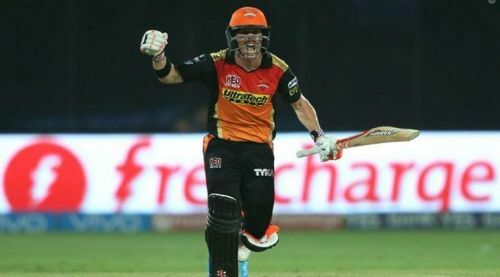 Due to the lack of support from the other side, the bulk of runs scored and the pressure in a huge game, against a formidable unit, Warner's 93* will go down in the IPL's elite list of match-winning performances.